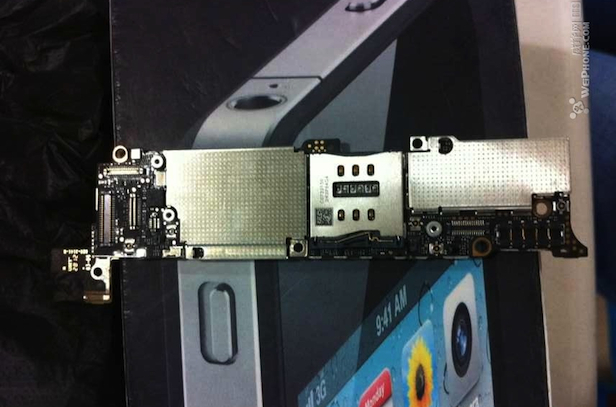 Previously, we shared leaked iPhone 5 photos that focused on the upcoming device’s motherboard. The pictures were shared on WeiPhone, a Chinese forum, by a user going by the name “GuoJun1984.” If true, these iPhone 5 photos do not only give us a look at the impressively small motherboard that the slimmed-down phone will be packing but give us some hints at the kind of new features it will be bringing with it on September 12. A closer look at these photos confirms that the iPhone 5 will be sporting a smaller sim card and a battery connector with 5 pins, compared to the iPhone 4S which had 4 pins. This may just suggest that the iPhone 5 will indeed have a higher battery capacity. As our earlier report also pointed out, these iPhone 5 photos reveal an extra wireless port. We speculated at the time that this could mean stronger WiFi or it would be used for 4G. But it;s highly possible that these additional antenna connections could actually be the smoking gun that confirms the inclusion of LTE on the iPhone 5. We say this all the time but it’s important to note that these are all just rumors at this point. Skeptics out there are already saying that if these were real, Apple would have already performed swift take-downs. But if you think about it, Apple may have smartened up and realized that those take-downs actually confirmed the veracity of those leaks. Perhaps they’ve decided that it makes more sense if they just sit and watch a nd let people speculate. It gets them more media anyway. Are all these rumored features enough to get you to camp outside your nearest Apple store? Share your thoughts in the comments below!